A great flexibility is provided in converting the videos to QuickTime MOV format. MOV files can be played using the QuickTime Player on Macintosh and Windows PC. 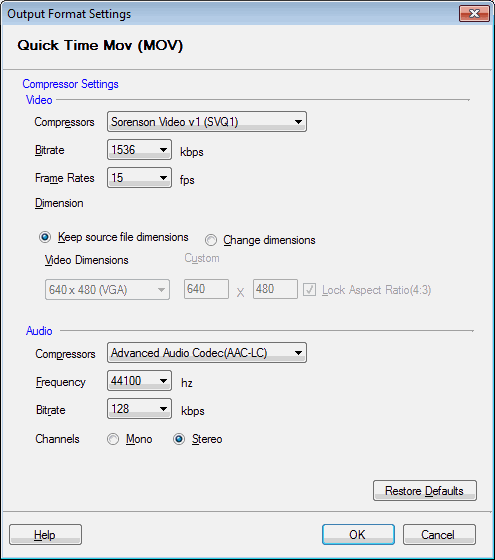 To get high quality output, there are several QuickTime video compressors provided. Click Formats >> Select Standard Formats >> QuickTime MOV >> Configure. Sorenson Video v1 (SVQ1) compressor delivers high-quality compressed videos. The frame rate is set to 15 fps, and the bitrate is 1536 Kbps. You can choose to retain or change the dimensions of the video. The mov files are saved using AAC compressor for sound. The frequency is set to 44100 Hz, and the bitrate is 128 Kbps. The Stereo audio channel creates an impression of sound heard from various directions.